Following and ongoing problem with poor ventilation within a first floor flat in Hackney Wick Kenwoods were called to attend. Lack of effective ventilation causes moisture build up, when this moisture comes into contact with a cold surface it condenses. This condensing forms water droplets which over time can cause black mould to form usually around windows and in corners. 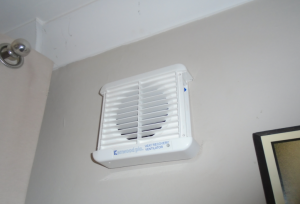 This particular installation required a unit within the bedroom to combat condensation. For bedrooms we often use Kenwood Heat Recovery ventilator. This unit provides quiet, trickle ventilation whilst retaining up to 80% heat recovery. Some great features of this system are the minimal running costs as well as being fitted with a night sensor so as not to disturb residents as they sleep. This is a discreet installation with 90% of the unit being within the brickwork. With this unit running the occupants should start to see results within 10 days.